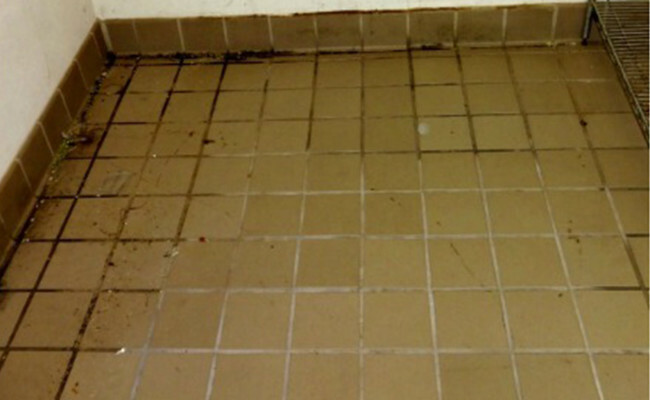 Spilled food and drinks, high traffic and use, and other factors contributed to the poor appearance and unsanitary condition of this floor. 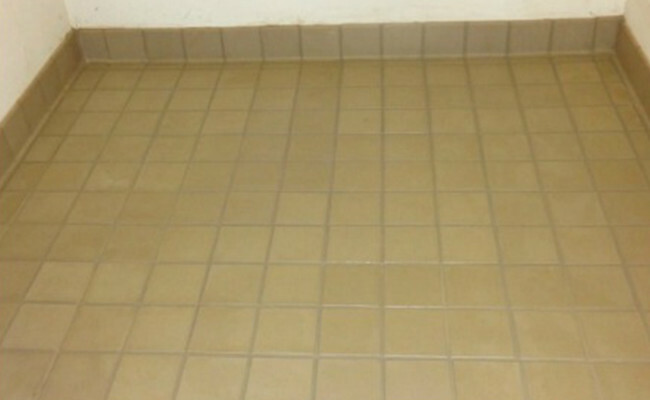 We cleaned and color sealed the tile and grout floor of this kitchen pantry in an assisted living facility. First, we removed all the large steel shelves and racks, then we cleaned and color sealed the tile and grout, and finally, we returned all the shelves and racks, including their contents, back to where they were before. This floor, despite all its high-traffic and use, won’t need to be professionally cleaned for at least a year, because of the color sealing. Color sealing the grout in the kitchen pantry was a smart management decision, because once the grout pores were sealed, spilled food and drinks could no longer become trapped deep within the pores. That makes regular janitorial cleaning much easier and more productive. In addition, color sealing prevents microscopic bacterial growth and is a constant-acting mildewcide, bactericide, and fungicide, making this kitchen pantry more sanitary. If you want to see the same dramatically clean and beautiful results for the tile and grout floors in your home or business, contact us online or call (407) 947-1416 today for a free estimate.